August will find the Dogs of the chase searching the Yellowstone. The biggest pack to date will travel in three groups. Each pack will search the most promising areas provided by previous exploration and interpretation of Forrest’s poem. Readers are invited to contribute. Learn from each other and check out new ideas. If you can’t be looking yourself we could look for you and report here what we find. Comments are welcome as are any questions. Day 1 Forrest’s last clue “it’s not in Utah or Idaho” narrows down where the home of Brown could be referring. 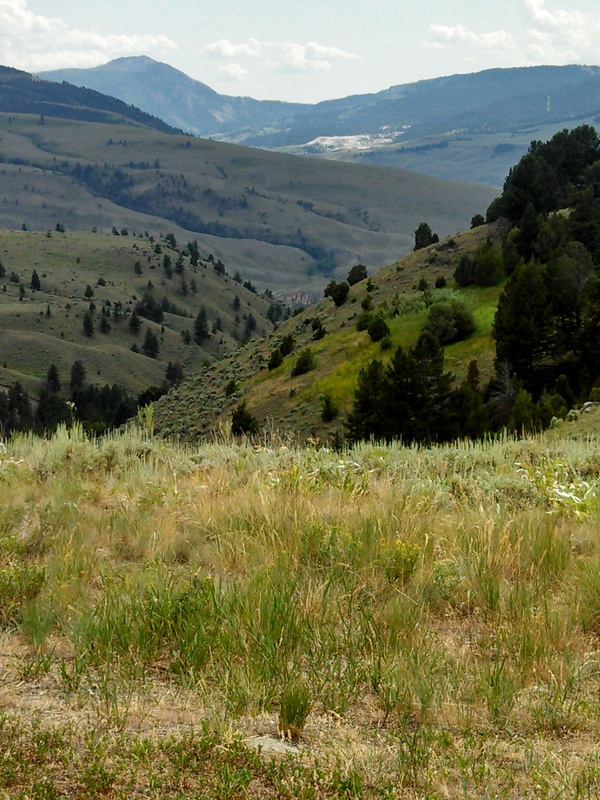 Lamar Valley is still in play (read earlier blogs) but the Browns in Idaho are eliminated. This leaves the Brown on the north side of the park. Uncle Joe Brown a prospector who has a forest, a trail and a boat put in/take out named after him. The Joe Brown turn out is located on Hwy 89 12.7 miles north of Gardiner Montana. 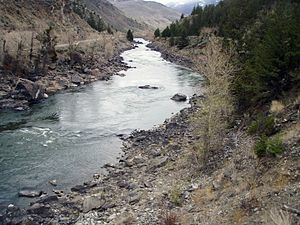 The Yellowstone River runs along Hwy 89 and boaters are warned not to go past Joe Brown unless experienced river guides. The area known as Yankee Jim Canyon is filled with heavy loads and water high. A Park Ranger told me Joe Brown’s home was in the Yankee Jim Canyon. Joe Brown found gold in Bear Gulch in the 1890’s. He later married and built a home in Gardiner. The exact location is a mystery as he moved around from Cooke to Cinnabar. 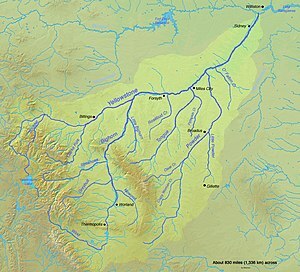 Day 2 Today we scout the west side of the Yellowstone River between Corwin Springs Bridge and Tom Miner Bridge. The road on the westside can get muddy and impassable. Weather is a factor here. I headed for the woods just upstream from the put in across from Joe Brown Trail, 12.7 miles north of Gardiner on Hwy 89. Three acres of cottonwoods, grass and wildflowers surround an open field perfect for a Gypsy Wagon Train Carnival. Lots of trees to look over. Above the woods were rock grevases from which the river and valley can be seen. From here one could watch the fly fishing boats and spy the mountain for wildlife. Someone enjoyed a six pack of Schlitz Beer from this site. These cans had been around for a long time. Made me think of having a sandwich and a flashlight. This area is public surrounded by private property. Fishing is done by boat mostly and not many people stop in this spot. Along the river’s edge be careful of the ants, if you tarry too long they come out and swarm up your legs. The waterline is interesting and many places to look for the chest. The Devils Slide is nearby and it seems like it should be included in the poem but I can’t find a fit. Ok, time to get cleaned up and then dinner overlooking the Yellowstone River. My favorite place to have an elk burger is just over the bridge in Gardiner on the back porch of the local tavern. The name of the place is Iron Horse Bar and Grill. Day 3 Today we went up the Joe Brown trail . The idea was to check aspens and cottonwoods (blazes) along the way as we climb to the forest named for Uncle Joe Brown. I should have rule this out after my desk clerk at Jim Bridges commented on the steepness of the trail. The view was awesome and after the first half mile we are greeted by a clear cold stream. Following the stream up were many stands of cottonwoods. I kept going up the stream tempted by the blaze and walked another mile or so. Then reality came back and I knew Forrest didn’t get this far at his age and condition. I decided to continue to the ridge and was rewarded with a view of the Joe Brown Forest I will never forget. The hike down and back to the car convinced me the treasure is not on that trail. The next move was to explore the Old Yellowstone Trail further north from the clearing I had scouted out on day two. Driving is easy on this road which at times uses the old railroad-track-bed. Three trails are here all going through what was the only way from the north to get to the Roosevelt Gate of the Yellowstone Park. 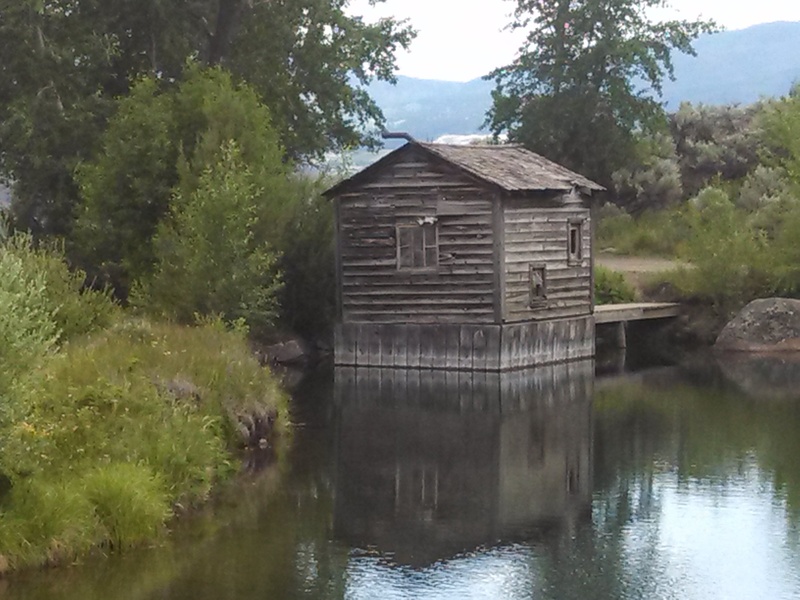 At a midpoint between Cinnabar and Tom Miner Creek is a day picnic area and historic site. The Tom Miner camp is close to Tom’s pay station. Mr. Miner charge $2.50 to get to Cinnabar and the Yellowstone. He in return manage the only road going through the canyon. The old signs could be a blaze as the trail itself. Lots of nooks and crannies to explore here. Great views from the rocks and lots of shade from the many pines. Few if any cottonwoods. A large party of hikers came by made up of a few young children and ten or so young men. All were dressed in od green fatigues. We greeted each other as they past and then they disappeared into the pines. Later I was told the military had done extensive games in that area. My guess is this group like the area so much they came back with their kids to do some hiking. Further south of this spot you can find all three trails. That being the old road Miner kept up, the railroad and the path the natives used. If you are wise and found the blaze came to mind. Could the wise refer to the oldest trail or highest trail? Close by is another blaze an old sign painted on a rock marking a gift shop. This stop is probably close to a hundred years old. Again some good places to look just below this sign and above the trails. Wow! This Joe Brown guy really gets around. Too Bad the Rocky Mountains we are looking for are north of Santa Fe. Time for R and R then tomorrow to Tom Miner Creek after a look around the boat put ins on the east side of the river. Please comment and as the saying goes I showed you mine so lets see some of yours. Day 4 Today we headed down to Joe Brown crossed Hwy 89 and look along the bank. I ruled this area out. Just not private enough. The next stop is Tom Miner camp site. After crossing the Tom Miner bridge its about 9 miles west and up the creek. We were back in national park land as we started up the trail at the end of the camp site. I thought I hit the jack pot. After just a few minutes I was surrounded by trees with blazes. I thought any time now I’ll see a blaze Forrest may have left 60 years ago. This is one of the few places that isn’t overrun by the tourist. The bad news is I felt like I was late for the party as no blaze was unchecked. When I walked to the creek, the mud slides had me hoping the chest wasn’t on the creek. If it were there it could be washed away or buried. I couldn’t help but think this area is too far from the home of Brown. This is still a great place to look if just for the beauty. The fields were full of color giving way to an easy ascent under mostly pine mixed with cottonwoods. Lots of bears in the area the big Brown type of bears. Heading back to camp I decided to check with the property owner where Tom Miner Creek runs into the Yellowstone River. He was very helpful. He says he knows it is not on his land. He also told me the Army had been in the area in large numbers along the Old Yellowstone Trail. Going back to Corwin Springs by way of the Old Trail brought me back to camp were the sunset will find me soaking my feet in the hot spring. While sitting at the hot spring a blaze shines nearby. West, down Yellowstone River, about a half mile the golden tower of light reflects in the yellow huge. How can the Devils Slide and The Tower of Light fit in the poem if only it would come to me my quest would cease. 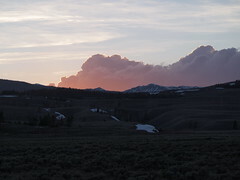 Lots of info to go as I checkout Jardine, Bear Gulch, Cinnabar, the graveyard outside of Gardiner, a visit to Cody, checking out Gardiner River and a revisit of Lamar Valley. Listen all and listen good 8,000 visitors and 44 comments. Seems that the goal of this blog is losing out. It is to share ideas on the chase. Here nothing is suppressed unless inappropriate. No insiders here. Finn doesn’t have any connection and nothing owed. I have been told to fade away but I got no quite. However it may be time to move on. I will chase this and other treasures to be sure but I will leave to the sites that are getting a good number of comments for their efforts. One such site is Dal’s he is a very good writer he has a good following. Return soon see what day 5 has and please comment you might just have the answer. Day 5 We head to Jardine today but before I tell you about that, I have been asked who is this team I refer to and who is with me presently. Billy Bobs White Shoe is my partner’s full name. He is my sidekick who has endured many a trip. Never complains even when we walked in the snow. Glad he only weighs 8 lbs when I carry him across the creeks but he’s no help with the bears. The others number as many as 8 and they join in as time allows. Nothing official just others who have wanted to enter the chase. One teammate is the head of G Dog Productions maybe thats why I refer to this loose group as Dogs of The Chase. Anyone is welcome to join in by setting up a time to meet or by sharing what they think on this blog. If you read the early entries you’ll find that I think the treasure may already have been found. This has upset some people so much that they ignore everything I have offered and wish I would go away. They seem like you just told them there is no Easter Bunny. I love the chase. I have been prospecting for at least 20 years. Big difference between slim and none, a chance or no chance. I don’t want to pretend there is a chest out there just to get along especially if its a hoax. So no one said It was were I think and no one says it was not there. I was there and the Chest was not and Fenn after receiving a complete picture history of the trail and place of the Immaculate Impression just didn’t have the courtesy to comment. Dal says it would give me a clue, but I already know its not there so the only clue is if it was not there. In other words I just got blown off. So instead of quitting I will do my best to leave no stone uncovered. On the way up to Jardine I stopped here and looked at the climb to get to the Yellowstone River as you can see in the next picture it would be too much for most 78 year olds. The Hot Springs are in the background to checkout where the creek meets the river I need to find away to drive closer. Now that is very interesting and it is on my list. Does anyone know if Fenn is Mormon? I may save this trip for the Dogs. Jardine is an old gold town. People still live there and they have a lot of no trespassing signs around. I enjoyed the view the outstanding area but it is not down from a warm water anything. Joe Brown was here no doubt but he is everywhere. Uncle Joe was at the ranch fishing when the ranch was burned by the natives he was also found gold at Bear Gulch and then again up in Jardine. Joe hung out in Cinnabar and made trips to Cooke City. If you really look close I believe Joe lived around Cinnabar and just may have had an ellias. From here I went north of Tom Miner Bridge. I checked on the Yellowstone River below a boat put in/take out just down from the bridge. There is an island with lots of cottonwoods not to far. No heavy loads, just past the rough waters of Yankee Jim Canyon. This will take a full day so I made my way back driving on the Old Yellowstone Trail stopping off where the a sign was painted on the rock. I spent the next few hours checking out this area. Great place to hide yourself or a chest. If you are looking for the treasure the treasure is safe. If you know where it is there’s nothing to look for. Those who have chased know its true, even being close won’t do. Lets hear from those who are home from searching we all would benefit and it would be all the more exciting. Day 6 we go across the Yellowstone River and check out the island like the one Capt. Kidd hide his chest on. Day 7 Today I headed back to the Yellowstone past Lamar Valley and the Ranger station then stopped in Cooke City. Joe Brown lived up in Cooke City while he searched for gold. One hunter commented that Uncle Joe had a claim in the Yellowstone area. What a great clue to share with the rest of the pack. From Cooke City I went on to Cody by way of the Chief Joesph Highway. I hope to paint the canyon where bright red clay meets vivid green grass. 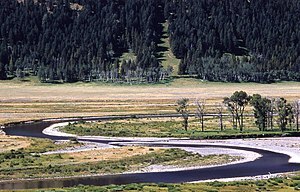 Cody is Forrest’s gateway to the Yellowstone. He is connected to the Wild Bill Cody Center which was well worth visiting. This trip kept reminding me of the first trip to Yellowstone. Gary Brown was easy to find but Uncle Joe is everywhere. Maybe a live rodeo tonight. There is one every night in Cody. Day 8 coming tomorrow. Stay tuned in, as I have info from Colorado, of treasures new and old. Keep up the comments as the latest ones were refreshing and exciting. Day 8 Drove back to The Park. Stopped in Mammoth Hot Springs. I hiked a few trails. Here man feels small to the power of Mother Nature. These hikes are rewards in themselves. I will leave most of YNP from Mammoth Hot Springs to Bear Gulch for others. Headed back to Gardiner where I talked to leatherman. He was in front of one of the cafes. The elderly man had a lot of cowboy in him. He was older but strong. He wore all leather apparel, hat, vest, pants, belt shoes and coat. I sat down and we talk for awhile. This wonderful gentleman and his wife road the Yellowstone National Park for years as they help with reach of the animals. A great cowboy artist who played college football and rode the range, He didn’t know about the treasure but he knows the Yellowstone. He told of the Old Yellowstone Trail and how the railroad used it to build a track to the Roosevelt Gate. We left Gardiner on the Old Yellowstone Trail and took it in the canyon down not too far to Cinnabar. We put in at a trailhead just north of the old town. we walked down a stream found a National Forest Blaze looked quickly down. Worked down to the river and I could look across to an area that is on the only website in the area. Now that is a place on the list. Day 9 Woke up in Corwin Springs got washed up and had coffee with the neighboring campers. This is a nice place to camp and the showers are very clean. $20 a night is not too much when the hot spring is thrown in plus God’s awesome beauty in valley. I decided to check out the boat put in over the Corwin Springs Bridge. To my surprise a bus filled with people pulled up. It seems one of the tour boat companies uses this point to launch from. I drifted back about the trees. I never saw a blaze but the waterline had many areas that looked good. Note to readers: Various difficulties have forced me to write days after the fact. I got to places where I had no connection to the internet. I traveled 1,100 miles to Minnesota and then 1,200 to Pagosa Springs Colorado. I am writing from Boise, Id. The 10 days has been over nearly a month but I have more info coming and an expert on trappers and miners in the Yellowstone area. Day 10 will review best spots and last looks. Then Treasure Falls becomes suspect. Day 10 Last look. Went to Tom Miner Creek had a look but I couldn’t walk in the mudslide area. This area is a good possibility but the chest could very well be buried if it were here. Checked out the trail to the bridge over Bear Gulch and took last look on the Old Yellowstone Trail just north of Cinnabar. Cinnabar is no more than an open area now days but at its outer boundary a stream is a good place to look. The last drive in the Yellowstone had me thinking it is not private enough for Fenn’s plans. Stop at the first turn-out past Lamar Ranger Research Station. The turn out is on the left side of Highway 212 about a half mile west or down stream. Remember only verses 2, 4 and 6 are leading the reader to the treasure. Verses 1,3 and 5 are true but they are only meant to distract the reader. Verse 2 tells where to start and where to put in. The “wise” may find the blaze. A little history, as before, leads to the three references to the treasure’s location. The famous Blaze of 1988 started in Quartz Creek about a half mile north of Lamar Ranger Station and later the blaze that threatened Cooke City crossed the Lamar River just up from the Lamar River Canyon. A picture of where it crossed can be found on the internet. National Geographic refers to the 1988 fire as “The Blaze” in the headline. The matriarch wolf of the pack living in the Lamar Canyon has a name and her name is Blaze. She was shot a few years ago and is no longer living. Looking from the car into the valley from the turn out you can see the blaze especially in September when the treasure was hidden by lonesome Forrest Fenn. It is then that the valley is ablaze with cottonwoods as they turn color. Forrest is a active member of the Wild Bill Cody Museum in Cody, Wyoming just outside the Northeast Gate of YNP. This is the way he would come to spend his summers away from his dreaded school life in Lubbock, Texas. The museum has a black bow tie ball in September. Oh, by the by, Gary Brown is the founder of the Forest Ranger’s Museum. Lots of history for an antiques dealer’s poem.